Bird in the Bush - A blog about life in Shepherd's Bush: Too cool for school? In some ways this is perhaps why The Defectors Weld could feel or look a bit out of place in Shepherd's Bush as it tries to cash in on the gastro-pub-full-of-badly-refurbed-antique-furniture-and-over-sized-lampshades breed of boozers that has now taken over London. I'll be honest I'm a bit bored of it and these days find myself more inspired by old man pubs untouched by a checked shirt or a pretentious fashion student. However Defectors Weld was the pub of choice for my flatmate Mo's twenty-something-th'ed birthday last week. You wouldn't see me arguing, as I get older I certainly have greater appreciation of a short walk home and tried and tested take away options. But I've never fully warmed to The Defectors Weld or found myself sinking into the ripped half stuffed leather sofas not wanting to be anywhere else in the world. For one thing it appears to be staffed only by trendy East Londoners who seem thoroughly pissed off to be at the wrong end of the Central Line. 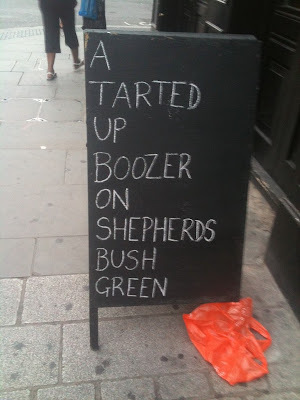 Secondly it's not a cheap pub. Thirdly ,they have taken the thrown-out-furniture feel a little too far. (NewMan and I went there recently for a Sunday afternoon of rude word Scrabble and a bottle of rouge only to find the only available table was wobbly, I got a splinter from my wooden rickety chair and apparently toilet seats in the Ladies were optional). Having said all the above, I don't hate the place and actually think it's a nice addition to the other Bush Boozers and is selfishly slightly closer to my abode than my personal favourites, The Goldhawk and The Crown & Sceptre. One plus side is that it appears to have evolved into a BBC pub and this brings in famous-ish people (I once saw Christine Bleakley - have just about recovered) and occasionally enough drunk producers in dated il-fitting T-Shirts who want to buy you drinks. I am yet to test the DJ's skills on a Friday or Saturday night or in fact the kitchen's offerings, but I have no doubt I will darken the doors of The Defectors Weld on many more occasions in the future, even if just to smile extra sweetly and promote the merits of the Bush to the sullen East London wannabe bar staff. * A regular sight every Shepherd's Bush resident should enjoy seeing at The Prince, 77 Goldhawk Road. Couldn't agree more. C&S every time. How I - and most QPR fans - long for the days of the Bushranger. Best pub in the bush. Still. 5 years after they gutted it. Also consider The Havelock. Original gastro from years back. Slightly pricey given SE Shepherds Bush location (as opposed to West Ken as all the local residents and Hilton try to pretend). i used to work at the bushranger. it was aces, you never knew what kind of crowd would be in on what night (apart from QPR gamedays of course) and it never got old showering the floor with sawdust. They have Fruli in the Defectors which is always good. The Princess Victoria is excellent, probably my fave. @Bree - was that when Keith the Boro lad was manager? He was a top bloke, adopted Rs fan. Will never forget scenes outside after QPR avoided relegation in '99 by beating Palace 6-0. Champagne sprayed from the balcony, tube drivers sounding their horns, cars joining in, just one massive party. A mate just registered the domain in the forlorn hope that it might be revived. JimF - it was from May 2001 onwards, for near on 2 years....brilliant fun. massively degenerate at times (sawdust is nicely absorbent) but pretty aces, got to know a lot of the QPR dudes. i learnt to yell 'hoops'.